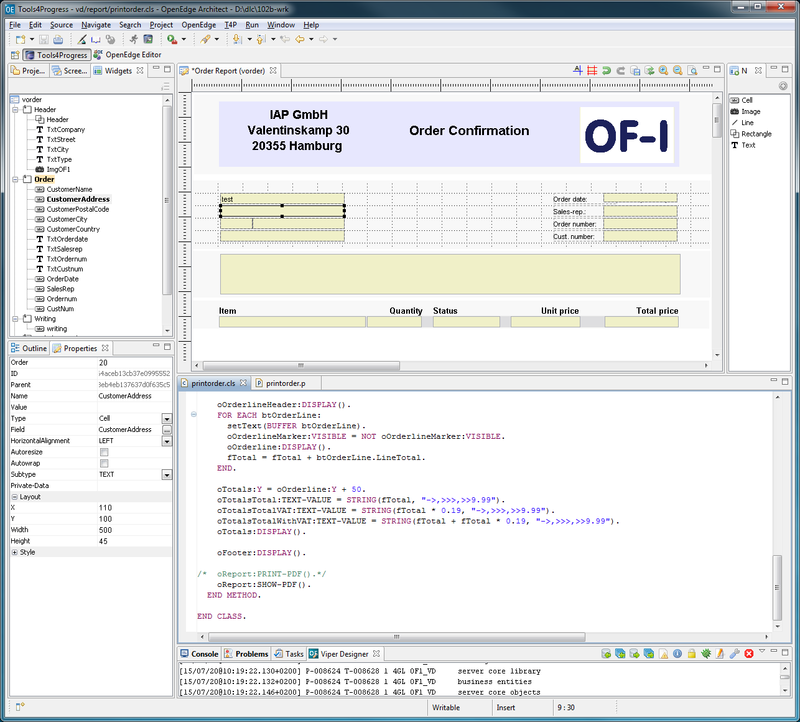 The upcoming Viper version 4.0 will run in the OpenEdge Eclipse environment (OE Architect / Studio). This screenshot ist made from a version 10 OE installation, but for sure it will run also in OE 11.x. The report has a structure, where every field, label or graphical element is a node in a tree. You can use the tree to navigate directly to an element. Every element has some properties and here is the place to maintain them. The properties have ui elements for input which makes sense, like a toggle box for boolean or colour chooser for coloured fields. Reports are organized in groups. Here in the designer the groups are visualized as grey rectangles. During runtime you can access these groups and the elements inside a group and fill them with data. This view is context sensitive and offers the elements you can add to the layout. The default API is now Object Oriented (OO) and therefore the good stuff like code completion is available. The OO API is also more handy than the procedure API – although these is still available to have everything compatible with older versions of Viper and OpenEdge.